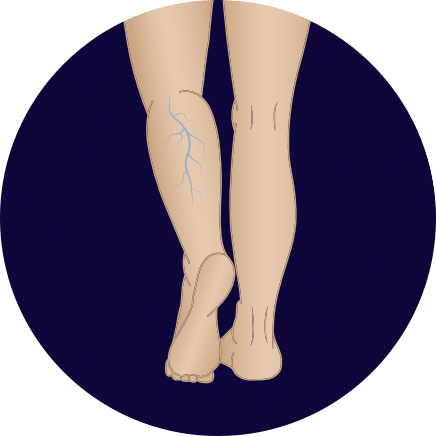 What are Varicose Veins and Do You Have Them? Varicose veins are a direct result of abnormal blood circulation caused by a weakness in the valves which makes it a struggle for the blood to flow upward and back to your heart. With this weakness, blood flow reverses and veins become twisted and bulge. While some of these issues may seem minor in the grand scheme of things, they can sometimes lead to more serious issues. This is why it’s important to get your veins treated right away. At El Paso Varicose Vein Laser Clinic, we can help you with varicose veins, spider veins, and leg ulcers. Most importantly, we treat venous reflux, the underlying cause of varicose veins and spider veins. All of our procedures are outpatient procedures allowing you to resume your normal daily activity immediately. There may be some minimal discomfort in the treated areas. We use state of the art technology and FDA approved solutions, ensuring your comfort and safety. At El Paso Varicose Veins Laser Clinic we can diagnose and treat your condition. All of our consultations and procedures are treated confidentially. With our competitive prices, you can't afford to pass up on this opportunity to have your varicose and spider veins treated. Many insurance plans cover varicose vein treatments and our clinic accepts most insurances, major credit cards, and gives self-pay discounts. Centrally located and with plenty of parking, come visit us today for a consultation!